It’s that time again, you guys! Back in August 2010 I decided to give myself a break from writing blog posts and instead shared a photo or two each day as a way to be present in my days without the pressure of finding words. I blogged about it (of course), invited everyone to join me and lo, The August Break was born. This is the fourth year I’ve hosted it and it’s been SO MUCH FUN to see it take off as a month-long community project. 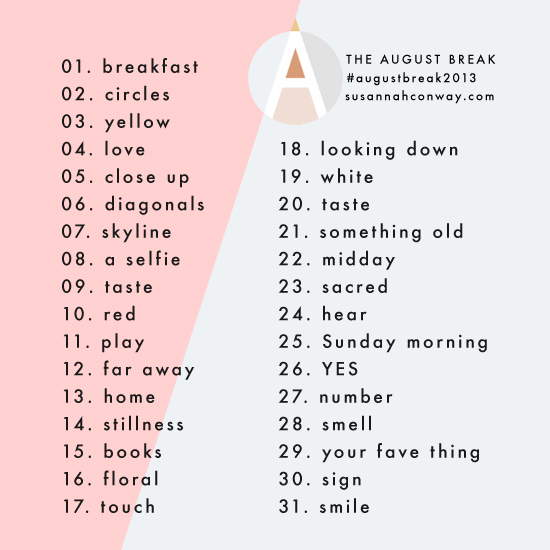 Each day, for the whole of August, you take a photo and share it on your blog. You can add words if you want — or not. You can use any camera. You could share a series of photos, or miss a day out, or just post on weekends. There are no real rules, basically. This is all about being present and enjoying taking photos just for the hell of it. And perhaps reinvigorating your love for blogging, or taking a break from writing. If you don’t have a blog you can add photos to the August Break Flickr pool. We’ll also have an Instagram hashtag — #augustbreak2013 — so we can gather as a group there, too. 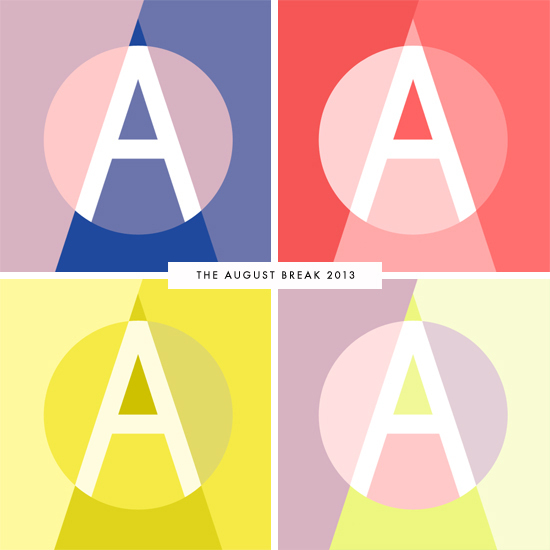 The fabulous Katrina Tan of Pugly Pixel has created yet another gorgeous August Break badge for us, so if you’d like to add it to your blog’s sidebar you can. She’s also created some wee footer badges you can use on your posts — the badge goodness is linked to over on the main August Break page. And, as always, I’ve created a blog roll so feel free to add your blog so we can all visit each other. That’s over HERE, too. I’m really looking forward to giving my over-thinky brain a rest this August and letting my images speak for me. I’ve got a few big posts up my sleeve too, but I’m not going to put any pressure on myself to get them published. Let’s just enjoy August and give our creative mojo a reboot! the list is so great! I’m definitely joining in this year. Hi and happy summer, Susannah! I look forward to this as well, thanks so much, love the prompts! This will be a perfect blend with your upcoming Photo Meditations class. Thank you! happy to be here again! will be abroad son probably will show my pictures mainly in instagram. Let’s roll!!! I am so happy having heard about this, Susannah! Guess I am going to combine parts of The August Break with my travel journal in some way. I’m joining you for the August break 2013. A list of photo daily prompts is a great idea. I enjoyed this last year. The prompts are a great idea. Sounds fun, I like the prompt idea! Have a happy weekend! That sounds refreshing. I might have to join in. I can’t wait to join you for my first ever August break. It’s perfectly timed as I’m trying to finish creating my 1st digital experience – and have been wanting to pick up my camera and start shooting again. This sounds like fun I will be on vacation the first week. Hopefully where I’m at I will be able to get on the Internet . Have a great weekend! With my final semester starting, this is the perfect way to not let my blog die but take away the pressure to blog. Great idea and I’m on board! I’m currently working on a new body of work, so my blog has taken a backseat. I guess I feel like i always need to post content and dont have much fun with my blog. Hopefully this August break will be just the push I need to have fun and be more consistent. Is this the fourth year??? Is that possible? I always look forward to The August Break, and this year is no exception. This is fantastic, I’ve been looking for something to inspire my instagram photos :D Looking forward to checking out the other entries!